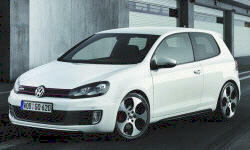 Volkswagen Golf / Rabbit / GTI Interior Styling Pros and Cons | Page 1 of 2 | Why Not This Car? The interior of the GTI is in another league. The Mazda 3 looks nice, but in reality it is really cheap, down to the terrible carpet. The GTI feels better. German quality and engineering is evident everywhere you look. VW continues to practice minimalist styling, in constrast to the crazy-making distraction present in Ford and Hyundais. Don't want your iPhone to talk to your car and tweet to your friends? This is your car. Excellent materials throughout. Clean and logical interior layout. Very functional instrument layout, high quality materials throughout, attractive illumination. Thoughtful layout, very good quality materials, no hard plastic. The quality of the materials used on the interior is very high. The cabin is a nice place to be. High end in appearance. Looks like it belongs in a much more expensive car. Again, excellent materials are present through out the cockpit. Clear and easily readable gauges, simple yet elegant, stylish and refined design along with class leading features give the GTI tons of creature comforts to go with the sublime performance. The Interlagos plaid seats are well-bolstered. Interior fit and finish are excellent with few "plasticy" bits. Classic mature styling. Most cars in this price range either look cheap inside, or like something designed to appeal to 16 year olds. The Rabbit just has a nice simple elegant dash with brushed aluminum accents, ergonomic controls, and good placement. This is where the GTI shines. The flat-bottomed steering wheel, bolstered seats, and easy-to-read instrument panel is all part of the excellent refinement of the VW interior. Comfortable and classy without over-doing it.